Yesterday it was sunny and gorgeous-right up until we were about to take photos. It started raining, then it stopped, and then started pouring while Drew and I were taking these. Luckily we were almost finished by the time the downpour hit! As we were driving to dinner (Chick-Fil-A to be exact. It’s one of my prego cravings don’t judge me! ), the sun came out and it was sunny the rest of the evening. We really timed that perfectly (not!!!). As you can see things are looking a little different around here! My blog was over-due for a design refresher and I couldn’t be more excited with how it turned out. I worked with Verisage Creative to help make my vision for the new Pink Peonies come to life! Verisage also worked with me on creating my Ecomm site for Rachel Parcell. Some new site features: the Home Decor section of this site is now integrated. You can finally find all my home related posts in one place! Same goes for all of my beauty content. We’ve divided all of my outfits into categories to make it easy for you if you’re trying to find outfit inspiration for a specific occasion or season! We’ve also added a newsletter! Those who subscribe to my newsletter will get an email every Friday with an extra blog post, saved exclusively for my subscribers. I’ll also occasionally send out notifications if there’s an amazing sale going on along with blog post updates. I hope you love the new design!! Thanks Eleni! The photos should be fixed now :) We were just having a few technical difficulties! Loving the new look, Rach! Pink Peonies just keeps getting better and better. I’m only able to see one image of this post but it’s gorgeous nonetheless. I can see only one picture:-(, bur its gorgeous! Awesome wedges and a perfect tote! Love the new design too! This entire outfit is to die for! I am obsessed with the hat and sunnies especially! Thank you so much Cheyanne!! The site looks great Rach!! I love how the home decor section is laid out. Gives me quick access to your great kitchen shots I love to look at! LOL Congrats!! Oh I love this new site! And thanks for making it easier to find outfit inspiration on you blog, I love to have a look sometimes at your outfits over the years! Love the new look of your site, Rach! I’m loving the new design and those platforms are SO good! Super great for casual days! Love your new blog revamp! Its absolutely gorgeous! As to be expected of course! LOVE! I think the only thing I don’t like about the new look is the fact that you can only see one post per page. These shoes only come in whole sizes.. I’m a 6.5. Do I go up or down? Hey Melva!! Do you always wear a 6.5? It’s hard to say because I’m a true 7 and I ordered a 7… Sorry I know that doesn’t really help! love it rach!! No worries I crave chick fila on the daily and I have no excuse lol I love this fresh outfit and those shoes!!! Loves!! Isn’t Chick Fil A the best?!?!! Thanks so much for commenting! Fresh new designs are the best!! Your site is super cute too! I’m seriously loving your new site Rach! It is so much more organized and fits your style so much more I think..congrats! You have a lot of exciting things coming this year. I can already tell it’s going to be an exciting year for you!! Love your updated website Rach! Love this casually chic look, those wedges are too cute! Wow!!! This is all SO exciting!!! I love the refresher and the home section is darling! Thank you for the feedback Leilani! We are working on fixing all of these bugs! Love these wedges! What a fun style! And you can certainly feel that after-the-rain crispiness of the air in the pictures – great shots! I’m loving your shoes!! SO cute! I also love the new look to your blog. So simple and pink <3 Hope you are having a wonderful week gorgeous. Oh thank you so much Thays!! Such a cute look. Love those wedges! I absolutely love this new design. It’s gorgeous! LOVE the new site design and newsletter feature…congrats!! love the new website set-up!! Love the new design, Rachel..❤️ Looks amazing!!!! LOVE the new site design! It looks great! This might be one of my favorite looks you’ve done lately, too! It’s so classic and easy which I love. Those Chloe wedges are amazing. Really?! Thanks so much Bryn! I think it might be one of my favorites too! I love your new site and that tote is gorgeous! Thanks Lulu :) It means a lot! Love the new site design! It’s a great fresh take on the old design! Love the new look! Fits you perfectly!! Can’t wait to explore the site more! Love the outfit post and those wedges!! The blog looks great! As is everything you do! I am LOVING those wedges! I have wanted those since I first saw them a few months ago. I am excited to be able to shop your home decor now! Thanks so much Tara!!! I love them too :) Glad you like the new site!! I love the new design Rach! seems like those things happen…silly rain! you look great in these photos and i am in love with that hat!!! Obsessed with your wedges. You have the best shoe (and bag) wardrobe!! Congrats on the new site! Really nice! I absolutely love the new features on your blog! It’s really great that all your outfits are now divided into categories. Congrats on your 2nd pregnancy, you are truly glowing! Yay!! I love it :) haha and I love this top! Love the new look of your site! 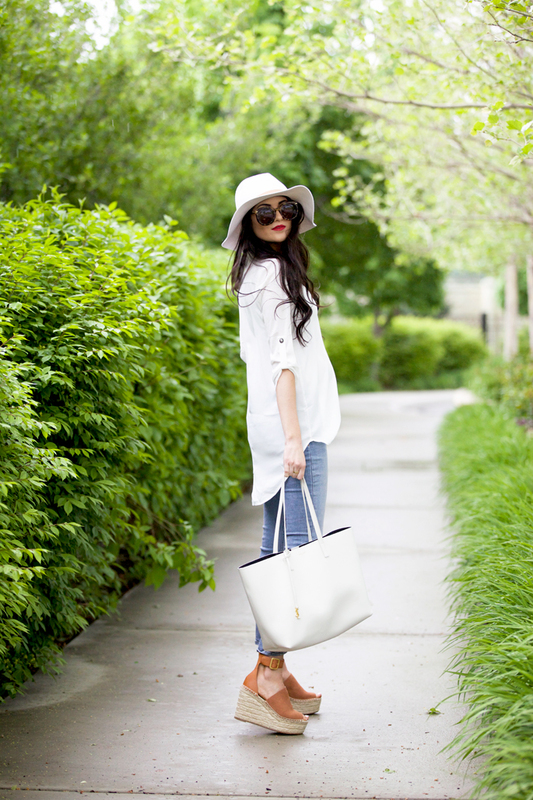 And love the hat and shoes in this post! Love the new site. It is beautiful. Thank you for making it more user friendly. When I was pregnant with my son, I craved Chick-fil-A, I think that I ate there at least once a week through the entire pregnancy! Congrats on having a boy! They are the sweetest! Just purchased this bag and absolutely love it! It’s the perfect summer tote. Your new website looks wonderful!